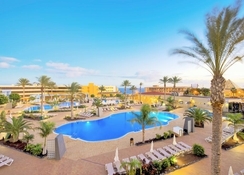 With a delightful setting on Jandia beach, the 4-star Hotel Iberostar Playa Gaviotas is located on the south-east tip of Fuerteventura Island, part of the Spanish Canary Islands. 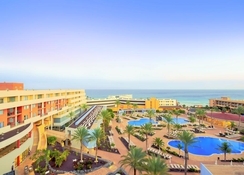 A couples and family hotel offering an All Inclusive option, the Iberostar Playa Gaviotas Park Hotel has 206 rooms (suites) over six floors in pleasant grounds with swaying palms. You can enjoy a choice of eating venues to suit your pace of holiday, bar service, entertainment programmes for all the family, sports activities, a great beach with water sports, terrific spa and fitness facilities and a host of activities onsite and nearby. And children of all ages from 4 years upwards can enjoy a range of own facilities and activities. 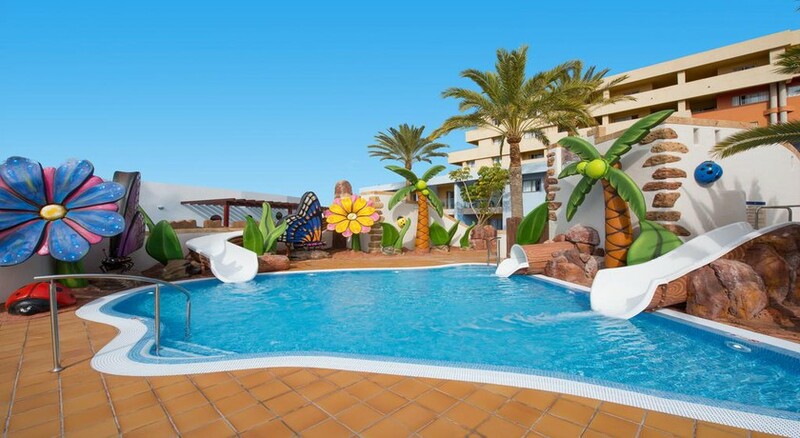 Book into the 4-star Iberostar Playa Gaviotas Park Hotel at Jandia beach on the Spanish Canary Island of Fuenteventura and relax and have fun! Catch a local bus to the nearby fishing village of Morro Jable (about 2km) to experience typical local Canarian lifestyles; explore the tranquillity of Jandia beach surrounds on foot or by bicycle. 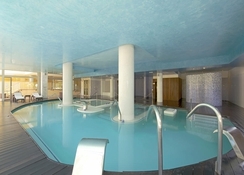 The property is 5km from Fuerteventura Port of Rosario International Airport. Guest accommodation at Hotel Iberostar Playa Gaviotas has an inviting Mediterranean-style decor of bright pastel interiors with drapes and fabrics of vivid colour, smart furnishings set on cool tiled flooring and modern amenities for your convenience; features include a private furnished balcony, air-conditioning, en suite bathroom, satellite TV, telephone, mini fridge and safe box for hire. There are adapted rooms available to guests with disabilities. Hotel Iberostar Playa Gaviotas has a swimming pool, sun terrace and gardens with loungers & parasols; Thai Zen SPAce includes a fitness room, thermal pool, Turkish bath, sauna, massage room and indoor Jacuzzi and offers a range of beauty, therapy and massage treatments influenced by the Far East; a comprehensive Fit & Fun sports programme to have fun while also keeping in shape. Onsite activities include rifle range or archery, snooker, basketball, darts; table tennis, tennis (lessons available) charge applies, and dance classes, direct beach access with access to external water sports, diving and catamaran sailing, cycling and hiking trails and nearby golf course. There is also a Children's pool and play area, games room with hosted activities, Mini Club (4-7 years), Maxi Club (8-12 years), Teenie Club (13-17 years), children's menu and evening child care service (charge). We booked this hotel based on the star ratings and reviews, it was very nice. The staff were very polite and the kids club was great, the kids especially enjoyed the evening entertainment. The food was average and what you expect from an all inclusive, although the theme nights were very nice. All in all a very nice experience, the only thing that let our stay down was the weather and because of this we won’t be visiting the island again!